He spent three seasons at Barcelona FC from 2011 to 2014 in the shadow of Messi, Iniesta, Xavi Hernandez & co. Although beset by minor injuries, Alexis Sanchez could have played in more than the 88 matches he featured and the 39 goals that he scored for the Catalan club does not do justice to the amazing talents of this 26-year old Chilean forward. Arsene Wenger probably sensed an opportunity here, lost no time in signing the Chilean over from Barcelona to Arsenal for a £32million fee. Since July 2014, the time when Sanchez was signed, his value has seen just one direction - up! No player in the English Premier League has made such an impact. His involvement in 19 goals, 12 into the net and 7 assists is better than any player in the competition. His ability to play on the left, right and upfront is what has endeared him to Wenger. He showed his ability as a center-forward when he netted a brace against Stoke City recently, underlining his versatility. His immensely exerting style of play led many to believe that there could be intermittent pauses in his appearances during the winter months. But he confounded all of them by putting in a high-voltage performance against Stoke. His cross to Laurent Koscielny was so perfect to the inch that the latter had to tap in one of the easiest of headers. That was followed by an un-selfish pass to Theo Walcott after being in the scoring line for a sure hat-trick. Walcott botched up a sitter; but far from being disappointed, Sanchez had a quick clap of encouragement for his team-mate. Apart from lauding his talents as a player, Barca coach Pep Guardiola had described the young Chilean as a nice kid, too. Alexis Sanchez made his Arsenal debut in a Community Shield clash against Manchester City on August 10 and helped the Gunners win 3-0. August 16 saw him making his first EPL appearance for his club and assisting a Koscielny goal in a 2-1 victory. His goal against Besiktas in a 1-0 win was instrumental in getting the Gunners a spot in the group stage of the Champions League. His first goal in the EPL came against Leicester City. His next one came in a scintillating 2-2 draw against Manchester City at the Emirates where his amazing technique helped him sidefoot a high volley past Joe Hart. Sanchez stamped his influence on Arsenal's Champions League campaign this season. He netted the third goal in a 4-1 win over Galatasary. Danny Welbeck's two goals in the match came from direct Sanchez assists. His goal in the 2-0 win over Borussia Dortmund ensured his club's berth in the round of 16. Although there are few doubts about Sanchez's talent and the great impact he has made on the Gunners, Wenger is wary of pushing his star player into performing more. But team-mate Oxlade-Chamberlain is not worried. He feels the Chilean has plenty of natural energy to carry him through and has likened him to a Duracell battery. Arsenal ,after 21 games in the EPL are in the 5th position with 36 points. 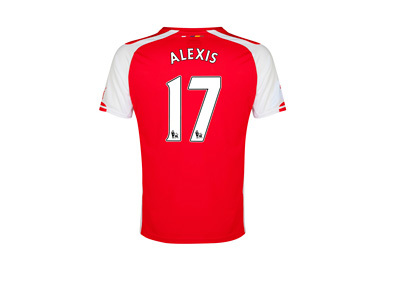 In fact, they could have been worse off without Alexis Sanchez. Just a point behind Manchester United and three behind Southampton, the Gunners have a fighting chance to make it to the top four by the time the season ends in May. They will owe that to no one else but their talismanic Chilean forward. Yes, Alexis Sanchez, the "Duracell battery", has indeed lightened up the Premier League and one can look forward to more fireworks from this 5ft 7in muscular dynamite.